The Lunenburg Cultural Centre is proud to present Amy Rice as the first participant in our Visiting Artist Series. 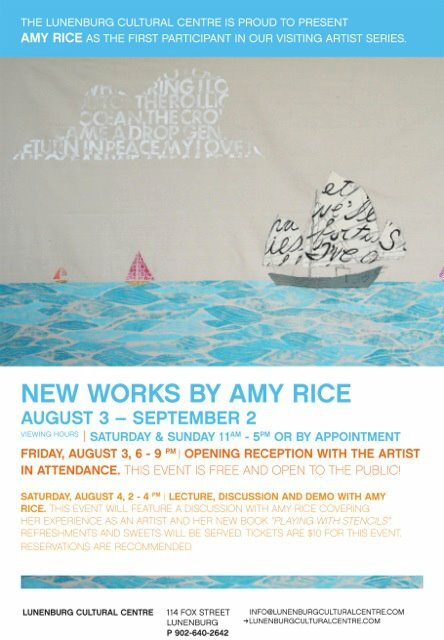 New Works from Amy Rice August 3 - Sept 2, 2012 Viewing hours: Saturday & Sunday 11am-5pm or by appointment. Friday, August 3, 6-9pm Opening reception with the artist in attendance. This event is free and open to the public! Saturday, August 4, 2-4pm Lecture, discussion and printmaking demo with Amy Rice. This event will feature a discussion with Amy Rice covering her experience in the art world as well as her forthcoming book "Playing with Stencils". Additionally, the Artist will give demonstrations on various printmaking techniques. Each person will have the opportunity to make their own piece of art on site with printmaking and collage. Refreshments and sweets will be served. Tickets are $10 for this event. Tickets are available at the Lunenburg Cultural Centre. Advance purchases are recommended.